Welcome to Jen Marks DACM, L.Ac. Acupuncture website. Jen Marks Acupuncture and Herbal Medicine, LLC serves the Savannah community and the nearby towns of Pooler, Hinesville, Brooklet, Thunderbolt, Wilmington Island, Tybee, Garden City, Isle of Hope, Whitemarsh Island, Richmond Hill, Port Wentworth, and Skidaway Island. Jen will be posting Acupuncture updates, articles, recipes, nutritional tidbits, news about East Asian Medicine (EAM) and Herbal plant remedies. Please feel free to email her with any questions or comments you have about the articles posted, or to schedule an appointment. There are two steps to making the recipe. The first part makes the paste, and then the paste is used in the second part of the recipe. In a small pot, put ¼ cup of Turmeric and ½ cup of water. Turn heat onto a low-medium flame. Stir regularly until the mixture becomes a smooth and thick paste. This process takes roughly 6-10 minutes, the smoother the paste the less grainy the final product will be. If the mixture starts to dry out, add a few sprinkles more of water. After finished, store in a glass jar with a lid/cover. This mixture will stay good in the refrigerator for about 2+ weeks. It will smell metallic if goes bad. Place 2 teaspoons of the paste that was previously made into a pot. Add 1 cup of milk (cow, goat, almond, hemp, oat, etc) into the pot. Add sweetener (this is optional) 1 teaspoon of maple syrup (dark Grade A), honey, agave into the pot. Add 1/8 teaspoon black pepper into the pot. Turn heat onto a low-medium flame. The milk does not need to boil, warm to taste. Stir mixture as it warms. Put 1 teaspoon oil of your choice into your tea cup (Udo’s 3-6-9, coconut oil, black cumin oil, edible sweet almond oil). Pour golden milk into cup with oil, stir and enjoy! This recipe is malleable; feel free to change it as desired. May also want to cut recipe in half if too much for one dose. Drink for a minimum of 14 days straight, either each morning or each evening for optimal effect. Happy New Year to all, we have made it to 2018! Winter down south has been akin to a real winter (we had snow to prove it! ), even though for us it may not last as long as our friends up north. The flu has been going around and some are more susceptible than others. Here are a few ways for everyone to stay healthy: drink water (always number one); water requires the least amount of effort to be processed and integrated, it keeps our blood circulating, detoxes our system, and keeps us hydrated. How much water is enough? Take your body weight divide that in half, and that’s your goal for ounces of water per day. Vitamin C, Oregano Oil, Elderberry syrup are three other great immune protectors. Garlic tea with lemon and a drop of honey will fight bacteria, cleanse the organs, and coat your throat. To make, take one clove of garlic smash into tiny pieces and pour boiling water over and drink (you can also eat the garlic), add lemon and honey. Winter is a time for slowing down, listen to your body – it will signal you when it needs more rest; go to bed earlier, stay in bed later – this is the wisdom of winter. Turn down your phone, computer, and tv for 3 minutes, close your eyes and breath, offer your system a chance to reboot. Spring will be here soon, in the meantime may we all be humbled by the winter. If you find yourself with extra coats, gloves, hats, heaters look into the Chatham Savannah Authority for the Homeless as they can always use donations. It has been over one year since an update. Over the past year I have been filling-up on new teachings in order to continue learning and traveling to study with teachers. I am currently half way through a two-year Graduate Mentorship Program focused on herbology that delves into the classical text, the Shang Hun Lun. This program is under the guidance of Sharon Weizenbaum, L.Ac. June of 2017 I flew to Syracuse, New York to study Trigger Point and Motor Point Orthopedic Acupuncture with Richard Hazel L.Ac. and Dan Dominguez L.Ac. My love for continuing to learn new styles and techniques is for the purpose of offering the best care and treatment possible. I take these varied approaches and meld them into my own style that is rooted in Chinese Medicine, but meshed with my own intuition. My goal is to treat every person as an individual, and customize how I work to meet the needs and treatment goals of every one individually. Jen has returned from her studies in NYC. She attended a 4-day course studying the principles and theory of Acupuncture from the teachings of Dr.Tan’s legacy. To learn more about these studies please visit, Si Yuan Balance Method. The class was taught by Eileen Han, one of three of Dr. Tan’s most dedicated students. The course delved into Classical theory of understanding Acupuncture and the meridians based on the ancient texts; the I Ching and Ba Gua. The Balance Method uses the body to heal the body, tapping into the delicate system in which our body is connected. On the most basic level this means we can use alike joints to treat alike joints, eg. the ankle treats the wrist, and the knee treats the elbow. The most commonly accepted principle of using one part of the body to treat the whole is the well known practice of Foot Reflexology. Having already implemented this style of treatment in my practice for the past few years, it is my great pleasure to have deepened my studies in order to be better of service to all those who come to work with me towards greater healing of their self. Jen Marks Acupuncture & Herbal Medicine Center, LLC will be donating $5 per treatment for the month of April to Shelter from the Rain. Shelter From the Rain, Inc. (SFTR) is a 501(c)(3) non-profit, based out of Savannah, Georgia, that provides assistance to low-income single mothers and children in need through acts of kindness that nurture the mind, body, and soul. SFTR is designed to show how God’s love shelters us from the different rain showers that come into our lives. We offer food, clothing, job search assistance, baby supplies, household items, mentorship, education and a support group for moms. It is our desire to develop positive, lasting relationships with and between our moms in order to help them reach their goals and provide for their children. Jennifer T. Graham is the Founder and Director of Shelter From the Rain. She loves to give hope to families through acts of kindness. Her personal experience with teenage pregnancy, at the age of sixteen, has given her a strong passion for outreach and helping other mothers in need. Graham has learned firsthand what it means to be a single mother and depend on the help of others to reach her goals in life. There are several ways to show kindness to Shelter From the Rain! If you would like to donate, volunteer or purchase a “Mommy Mug”, please visit www.shelterfromtherain.com or contact Jennifer via email at 912-232-5860 and info@shelterfromtherain.com. Time Fly’s, and so do Birds, and many other Creatures too. Thank you to everyone who came to share space in my office for the month of February! We were able to raise another great donation for Deep. Deep was our February Non-Profit of the month, and we donated $5 per treatment from everyone who came for Acupuncture. If you have not yet visited Deep’s website, I highly encourage you to do so. I love Deep for so many reasons, but to name a few…they are helping children in our community learn to express themselves through the written word, and then giving them an opportunity twice a year to read their stories, essays, poems, etc on stage in front of a LARGE audience. They are teaching these kids to be brave, courageous, to speak their truth, and to gain a deeper connection to their own hearts. What more could we ask for? The Deep staff give so much of themselves, and all for the name of education, literacy, creative fulfillment, and community. I am honored and grateful to do that work that I do, and to be able to recognize a local non-profit for their work. If you would like to donate your time or money, you can visit Deep to learn more. We are wrapping up our first ‘Non-Profit of the Month’ for January. We will be donating $5 for each person that received a treatment during the month of January to Loop It Up Savannah. I hope everyone had a chance to check out Loop It Up Savannah. If you would like to learn more, donate or volunteer you can contact Molly Lieberman directly at looplinktangle@gmail.com or by calling 912-660-2812. February brings about a new month, and a new non-profit. For the month of February Jen Marks Acupuncture & Herbal Medicine Center, LLC will be donating $5 per treatment for the month of February to Deep Center. Please take a moment to learn more about Deep Center. Deep Center is a 501(c)3 nonprofit that provides free, fun, and rigorous writing workshops for public school students in Savannah, Georgia. We connect kids with a thriving community of writing mentors—local authors, poets, and journalists—to help them share their stories. You can visit Deep Center to learn more, donate or volunteer as a fellow by visiting Deep online. The purpose of the non-profit a month is to highlight a local non-profit, give back to the community and educate the people of Savannah about the beautiful work being invested into our city to better take care of each other. To each person that received a treatment, I thank you, it is because of your support and trust in me that I am able to to support the work of others. For the month of January Jen Marks Acupuncture & Herbal Medicine Center, LLC will be donating $5 per treatment to Loop It Up Savannah. – Molly Lieberman, Founder and Director of Loop It Up Savannah Inc. If you are interested in learning more, donating, or volunteering with Loop It Up Savannah you can contact Molly Lieberman directly at looplinktangle@gmail.com or by calling 912-660-2812, or visit them on Facebook. To Support you can purchase their 2016 art calendar through Etsy. Starting January 2016 Jen will be partnering with a local non-profit each month for January and February and then every other month throughout the year. Each non-profit will be featured to educate the community about the programs that are offered locally, to highlight the good people doing great work and Jen Marks Acupuncture will be donating $5 per treatment given each month to the local non-profit of the month. Each month Jen will post the featured non-profit so you can learn more. I encourage each person to visit the websites of these non-profits to learn about them. If there is a local non-profit that you would like to see recognized, please have someone from the organization contact Jen either via email or phone. Wishing you a New Year that is in alignment with who you choose to become! Jen is continuing her studies towards earning a Doctorate in Chinese Medicine. Her office hours starting in January will be Monday, Tuesday, Thursday and Friday. Wednesdays will be school days, and she will not be in the office. Jen is traveling out of the country. She will be studying and traveling in India. Jen will return to Savannah on August 11th. You can still send emails, but she will have limited access to check her email, so response time will be slower than normal. If you would like to schedule an appointment for when she is back, email a few days and times when you would like to come, and she will get back to you. Spring is here, and there are some easy ways to help transition into the warmer months. Winter was a time for introspection, a time for looking within, resting, and spending more time at home. The transition of Winter into Spring is Yang bursting forth from Yin. Below the wet and cold (yin) ground of winter, seeds have been sinking their roots deep into the soil, nourishing themselves. As Spring hits, the seeds crack open (yang) and a sprout rises. This did not happen overnight, this was a process, a daily practice of patience knowing its’ day would come. Alas, the seedling sprouted, and a new quest it endures; the same is true for us. We have rested, and nourished ourselves so as we move into the high energy of spring we are ready to go on the journeys that await! – Dandelion is the leaf of spring, and a great liver detoxifier. Spring is the energy of wood, the liver, and the color green. Dandelion greens are best for detoxing the liver this time of year, but dandelion root tea is also a good second. – If you love juicing, now is the time to do it. Spring is the time for detox, it is when our bodies can most handle the purging of that which no longer serves us. Just make sure when you juice to add a slice or two of ginger, this will protect your stomach and aid in digestion. – Rhubarb, broccoli, asparagus, strawberries, cherries, artichokes, peas, and apricots to name a few are some of the ideal foods to eat in the spring – as these are the months when these begin to come into season. Some are early Spring, and some later in the season. Keep your eyes peeled for new additions at the farmers market, the coop, or in your local grocery store. – Acupuncture is great for Spring and seasonal allergies. It can help to boost the immune system, soften the eyes, open the sinus’ and clear out any discharge that may be lurking. – Cupping and Gua Sha are also good tools around this time of year as they can help to assist in the bodies natural desire to detox during the transition into Spring. “On the Wheel, Off the Wheel” – My Teacher isn’t wearing any clothes! “When the student is ready, the teacher will appear.” I often wondered, then, where my teacher was. Appearances can be very deceptive. My teacher showed up a few months ago, and it isn’t wearing any clothes. Few practices of self-reflection are better than looking into the eyes of another, or learning something new. If you have ever taken a yoga class you might have heard the phrase, “on the mat, off the mat.” It means how we experience yoga on the mat is likely indicative of how we experience life off the mat. Often times, when I practicing yoga, I find myself irritable and frustrated. I push myself into the best structural position for the Asana or, accidently, looking around the room and realize I am standing on my right foot rather than my left only to beat myself up for not being able to follow the simplest of directions. Ultimately, I know this is about more than the posture. Asana practice has never been my path to enlightenment of the phrase, “on the mat, off the mat.” My path to this deeper truth has been through pottery. Three months ago, I decided to sign up for my first pottery class – a desire I’ve had for over a decade. I was overwhelmed with excitement, but that excitement faded on my very first day when I quickly grew irritated with the pottery process. After releasing my frustration, I once again became filled with excitement to know that next week would bring a second chance – not just to learn pottery, but to show that I am capable of learning something new without getting upset. The second week arrived and, somehow, my skills were even worse – I was so irritated that I couldn’t enjoy myself. Aware of my dilemma, I focused on holding the frustration within myself while actively working on shifting my perception. I knew this struggle was not about the pottery, but was about me – my ego and need to be great. This struggle was about my inability to completely let go, a constant endeavor with a goal I strive to achieve. Let go, know that I’m whole, and love who I am. I would show up each week from then on and allow pottery to be my time for reflection. “On the wheel, off the wheel,” I would tell myself. I may never master the wheel, I may never make the most beautiful piece of pottery, but it’ll at least help me practice letting go. Pottery class became my center for Zen training. Meditation comes in all shapes and sizes, with form and without. It’s a process we take everywhere and anywhere. Meditation is not about sitting on a mat, eyes nearly closed and aimed at the floor – it’s a process of self-reflection, thinking through unhelpful thoughts, and practicing seeing truth in all. By week six, it was time to glaze my creations. It couldn’t be that hard, I thought – dipping your clay into liquid glass and colorant – but frustration reared its head once again. I messed up every single piece. I had to start again. “On the wheel, off the wheel,” I thought. “In the glaze, out of the glaze!” After that first week, no one would’ve thought I might actually want to continue, but I did – badly. I’m now in my second round of classes, and already signed up for my third. I love connecting with clay, with the earth, but pottery is more than that for me. It’s my time to reflect on what I’m bringing to the wheel – my time to observe, let go, and center. Pottery is my time to reconnect, and to remember to enjoy the process. Pottery is my yoga, my meditation practice. I truly enjoy pushing myself, to continually learn that our limitations are only those we put on ourselves. I am not suggesting that you take a pottery class or begin practicing yoga. I am suggesting that you begin to observe how you show up, to learn what you’re bringing to the wheel or the mat. When you look into a stranger’s eyes, or your partner’s eyes, what do you see? How do you feel? It’s never about the clay. It’s never about what we think it is. So, what’s it about? Where can you find space for self-reflection? What is your wheel? This was an experiment suggested last year for December 31, 2013, this year it is suggested for December 31, 2014 . You can scroll below to find in-depth details, but here is the gist. If you completed this exercise last year, go get your Manifestation Jar 2014 and read below (all the way to the end before beginning). If this is your first year, find a a jar with a lid, get some scrap pieces of paper and a writing utensil. Sit down, close your eyes, place one hand on your belly and the other hand on your knee/thigh. Take a slow gentle breath into your belly and feel your hand push away from you as your breath fills your belly. Repeat this breathing exercise for 3 minutes, attempting to clear your mind of the to-do’s and focus on your breath. Once you have taken a few minutes to clear your mind and bring your attention to the moment think about all the different aspects of life you would like to engage in. Begin to write down as many desires as you can for things you would like to accomplish in a day, a week, a month, a year or a lifetime. The limitations are only those you create for yourself. After you have written down all of your thought seeds for manifestation fold them in half and place them in the jar, and seal it with the lid. Take your jar and place it in a spot where you might see it occasionally, but are not going to be consumed with the stress of having to complete these goals. You have put them out there, committed your ideas to paper, let the rest unfold. On December 31, 2015 you will take your jar off the shelf, open it up and see what you accomplished; make 3 piles: Pile #1 – what you accomplished, Pile #2 – what you didn’t accomplish and want to keep working towards and will put back in the jar for 2016, Pile #3 – what you didn’t accomplish and no longer speaks to you, you can discard. (For those who did Manifestation Jar 2014, you will start here, by separating your 3 piles). I wish you a warm, healthy, and loving New Year’s celebration. May the start of the New Year mean whatever you choose and create it to be. May you be courageous in your desires, honest in your thoughts, pure in your heart, and compassionate towards your sprit. May you practice the belief that you do hold the power to create. I too wish these words upon myself. I receive regular emails from Abdi Assadi’s mailing list. Abdi is an acupuncturist and healer who I have followed professionally and have completed group studies with in NYC. I admire his ability to understand the human condition, and encourage others to sit in the muck as I also practice myself and encourage others to take part in. I enjoy reading his responses to people’s personal inquiries of challenges they are facing and looking to overcome. This particular Q&A spoke more broadly, and I think speaks a truth that all of us would benefit to be reminded of one time or another. I know there have been many times where I have had to choose non-action as my form of action. When this concept was new to me, when I first realized that I could choose, to not choose and this was taking action; not letting circumstance take ahold of me, was a liberating moment. If you have ever questioned your path, time, action, direction, intuition, etc. I deeply encourage you to read the article below. Sending love, warmth, and healing compassion to all. In Chinese Medicine 5 Element Theory all of the different aspects of life listed above are connected. Pears when cooked nourish the yin aspect of the Lungs. Often in Fall we suffer from allergies, sore throats, and dry coughs. This is a great food choice for a sore/dry throat whether due to allergies or a cold. This can be good for anyone who smokes and has dryness in his or her lungs. In addition to the physical aspect of the Lungs/Throat pears can help when dealing with emotional grief. 1. Preheat oven to 350 degrees F. Butter a 9 X 13 baking dish with 1 teaspoon of butter. 2. Peel the pears, halve and core. 3. In a small bowl, whisk together the butter, vanilla and cinnamon. Brush the pears with the butter mixture on both sides. 4. Arrange the pears in the prepared baking dish, cut side down. Bake the pears 30 minutes on each side, or until fork-tender, basting them every 15 minutes with the pan juices. Gift certificates are available for purchase and are available in a specific dollar amount or you can purchase a certain number of treatments. All gift certificates purchased by December 15, 2014 will receive a 10% discount. Starting at the beginning of December evening hours will be added to the schedule. These hours will be in addition to the daytime hours, not in lieu of. Days open will still be Monday – Friday. Evening time appointments will not be available every day, but when you book an appointment if you are interested in an evening appointment please be sure to ask. I am going to see my family in New York and to visit a few friends in the city! I’ll be gone from December 8th through the 12th. Please be sure to book your appointment in advance if you think you want to get in before I leave or for when I return. Food culture continues to gain more awareness each day. All over the world people are paying attention to what they are eating, and it is now growing ever more popular to pay attention to what one is not eating. While this is great news, there is still an important piece to the puzzle missing. Our thoughts are equally important to what goes in our bodies. As we are what we eat, we are also our thoughts. To love another is to love thyself, to harbor anger at another is to harbor anger at thyself, to wish ill on another is to wish ill on thyself. These are not phrases merely preaching the golden rule, they are truths as factual as 2+2 = 4. Immunity and wellness is as much about exercise and eating well as it is about our thoughts. Chinese Medicine theory states that as long as we carry resentment towards another and carry unresolved emotions we will feel separate from others. This separation will keep us ill. This illness, especially when centered around anger will affect our digestion and therefore our bodies ability to nourish itself, create blood, and maintain optimal levels of Oxygenated blood traveling throughout the body. The food we eat, the air we breath, the thoughts we think are one. In order to take our health to the next level, it is time we take responsibility for our thoughts. I invite you to begin creating awareness of your thoughts; to create a mindful practice not only of what comes out of your mouth, but what surfaces in your mind. Meditation is one way to practice mindfulness, however, what I am suggesting is different than a sitting or walking mindfulness practice. Begin by acknowledging you will start noticing your thoughts. Once you make this commitment you have already shifted your awareness. Anytime a thought comes up that feels as if it might not serve your highest good acknowledge the thought and continue. For now, there is no further action needed that acknowledging. Sometimes when we work in the garden we merely notice all of the weeds, and perhaps another day we come back to pull or cut the weeds. For the next week watch the weeds within your mind grow. Once you have practiced watching them and seeing where they grow, then you can come back and begin to cut them. 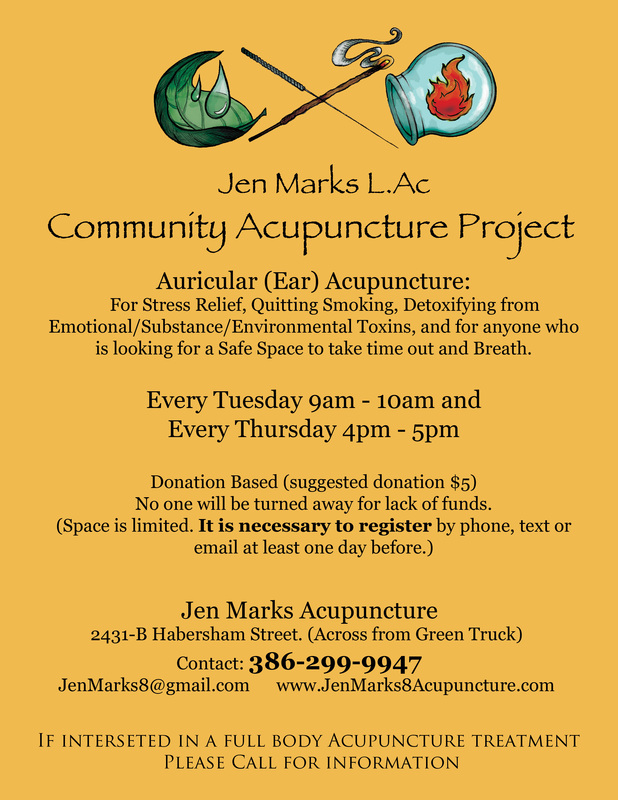 Starting May 1st, 2014 Jen Marks Acupuncture is offering a new Community Style Auricular (Ear) Acupuncture. Jen will still be offering full body private treatments, but is also hoping this will be an additional positive resource for the Savannah community. A reminder to honor, and to love self. – Saint Lucian maestro Derek Walcott. Beginning the Transition: Winter into Spring, it’s 2014! Winter is not quite gone, but Spring is right around the corner. This is not a ploy to rush the seasons, or jump too far ahead of the present moment. However, with the ever-changing seasonal weather patterns, it is no longer too soon to start thinking about clearing out the clutter in your personal space. Here I will share some ideas of ways to begin the process of cleaning out the cobwebs in your physical home, your bodily mind, and your ethereal spirit. Winter is a time for slowing down, turning inward, spending time in solitude, and resting. Winter is nourishment, it is the down-time that conjures up and stores the energy we will need when Spring does take its’ turn. Spring is for sprouting, it is the time of action, movement forward, it is the ‘Start’ button. So hopefully, we have all been taking time to rest, reflect and nourish ourselves. If not, lucky for us – there is still time to take a step back and ask, “Have I spent anytime slowing down, building energy, and resting?” If the answer is no, then you owe it to yourself and your health to slow down. I have found the best teacher for understanding the cobwebs of life is living in a 100+ year-old home with two animals. For some reason, when you are living in a 100+ year-old house with all the original wood floors, walls, windows, doors, etc – you keep a collection of 100+ year old dust no matter how often you try to sweep, clean and scrub. Although I am excited about the never-ending sweeping, I am grateful for my home, my cobweb teacher. In the dark is where the cobwebs form; where the sun does not shine, in the places we most forget to look. Whether we talk of cobwebs in the home or in our bodies there is no difference to how the cobwebs of the body, mind or spirit form. In our (heart) mind the one where we store our thoughts, feelings, emotions, desires of the future, feelings towards the past and the ever-aching attempt to be in the present is where we can find a lot of cobwebs and clutter. Oftentimes we are so busy running around we forget to stop and look within. Wherever the light does not shine (where we do not look), the cobwebs will form. In other words, when we do not clean the clutter/dust of our home it is dirty and sometimes may affect the air quality. When we do not clean the clutter of our minds, we may start to become sick, mentally fatigued, emotionally fatigued, and once we are no longer well in our bodies and our spirit too may get a case of the cobwebs. – Dust your home, and not just the areas you can see – shine the flashlight beyond the doors, counters, tables and desks. All those places you forget to look are the places, which need attention the most. – Get a box and make a goal to fill it with things in your home that you no longer need, or no longer serve you. If they are in good condition, donate them to a shelter. – Log-on to your email account and take 20 minutes to unsubscribe to all those automatic emails you have signed up for that bulk up your inbox everyday. You don’t have to clear them all – but the ones that perhaps email too often, or that no longer offer any input to your day. – Organize your shelves and cabinets. Chances are if you have not seen it in a year+ then you don’t need it. Also, if you haven’t used it in a year+ you probably don’t need it. If you do come across something you forgot you had set an intention with an expiration date to use it. If by the expiration date you still have not used it, it’s okay – but you probably don’t need it. – For your physical space, your body – it is time to move it. Stretch for 10 minutes upon waking, or set-aside some time during the day. – Spend sometime rolling around on the ground, letting your body loosen up. – Take some time to turn on the flashlight and look within. Find a quiet space, close your eyes and just breath. There doesn’t need to be any fancy breath work or visualizations. Just close yours eyes, take a deep breath and breathe. Let the flashlight guide you to the dark corners of your mind and begin to clear the clutter. – If meditation, breath work, and/or visualizations are something you have experience with, then get back in touch with those processes. Make time, put it on your calendar, place a sticky note on the bathroom mirror – whatever it takes. Spend some time with your practice. You will certainly find some clutter to dispose of. – Do something creative. You don’t have to be a ‘creative person’ or an ‘artist’ to do something creative. All you have to do is get some paper and a pen and just let your mind go, see where the pen takes you. You will always find something to draw – and whatever you put on paper becomes one less cobweb that was in your mind. You don’t even need to analyze it, just free up a little internal space. – If you have done any of the above mentioned for the physical/body and for the mind, then you have already done for the spirit. As the new year approaches the chatter rises, the most famous new year’s question; “what is your new year’s resolution?” Personally, I have never really been interested in New Year’s resolutions. I find they come on too strong , create too much pressure, and put all the eggs in one basket. Being open to the idea of change and creating a better version of oneself is always important. However, the ‘new year’s resolution’ has the potential to be another way for wellness companies to tap into your pocket and use this time for marketing. Everyday is a chance to create a positive change, so why not use the New Year for what it truly offers? Make your own Manifestation Jar. A friend shared this idea me with me last year and I gave it a go, 2014 will be the start of my 2nd manifestation jar. Who? You, your friend, your partner, and anyone else you would like to share this experience with. What? A jar filled with pieces of paper with handwritten goals, dreams, desires – whatever you want to manifest during the new year. Where? Anywhere. Your home, a park, near the water, under a tree….the where’s are limitless. The more specific the better, yet not so much that you feel trapped. The ideas can be as simple as getting a haircut to finishing writing that book you started 4 years ago. You are merely planting seeds for manifestation. This is your jar, use your imagination, tap into your desires and use your will to create. – A jar – I use a 16oz mason jar. I like that the jar is clear and has a lid. – A writing utensil – Pick your favorite pen, marker, pencil and in any color you desire. These are your manifestation seeds after all. – Paper – I like to use colored paper. – Scissors or your hands to rip up the paper in whatever length/shape you would like. Once you have all of the tools find a comfortable place to sit. Close your eyes and take a few deep breaths. If you are able to sit still for a few minutes, take this time to clear your mind and focus only on your breath coming in and going out. Once you have sat still for a period of time that feels good for you open your eyes and when you are ready start writing down your goals, dreams, desires – all those things you would like to manifest in the new year. I suggest writing each manifestation on its own sheet of paper, fold it in half and then place it in the jar. You are free to write as many as you want. Remember, they do not have to be finished just within the year. Seeds once planted take time to grow, some may sprout and grow rapidly, some may seem like they are never growing – but they are, at their own pace. Once you have written down all of your manifestations seal your jar and place it in a location where you will see it and be reminded of your manifestation jar, but will not be consumed by the thought. I keep mine on the top shelf in the closet so I can see it daily, but it remains enough in my subconscious that I do not obsess what is in my jar. On December 31, 2014 you can take out your manifestation jar and see what seeds grew, what seeds you outgrew, and perhaps what seeds need more time. Then you can make a new manifestation jar for the coming year. If there were any goals left unfulfilled and you still want to fulfill them, place them back in the jar. Spend time reflecting on the previous year and what you want to create for the year ahead. I wish you all a wonderful Solstice, New Year, and time filled with love and joy to share amongst friends and family. Jen is heading to New York for a weekend class to study Abdominal Acupuncture. This is a style of treatment using only the abdomen to treat. This is done by mapping out the entire body on the abdomen. This is what is known as using a microsystem to treat the whole (macro). There are many microsystems used in Acupuncture; such as the ear, hands, feet, and even mapping out the body on the legs and the arms. I will be studying with, Paul Ryan L.Ac , who has just returned from China, spending the last 18 years studying this system with Dr. Bo, the excavator of Abdominal Acupuncture. I am excited to learn and be able to share this method with my patients for a greater way to treat and help the body to heal. Majority of my shopping takes place at the Savannah Co-op, this is where I purchase my dairy, eggs, pasta and produce. All of the products come from local and organic farms. It feels great to know all of my produce is in season, was delivered from a short distance in a truck, and that I am supporting the local farmers. However, I still do make occasional trips to the grocery store or my local health food store to fill in the gaps between Co-op pick up days. I do my best to buy organic and non-GMO products from companies that I trust are true to their word. I recently read, Blacklisted: 12 Food Companies to Avoid and was disheartened to learn that some of the major health brands are actually sub-companies of the larger corporations who are actually attempting to prevent the forward progress of GMO and non-GMO product labeling. Blacklisted: 12 Food Companies to Avoid, is an interesting article about the brands we think are in the clear, but are really sub-companies under the big guys. This article first shares information, then shares the big bad bullies and their sub-companies, but keep going for the silver lining – they also inform which companies still maintain a sense of pure intention and honest truth to their product and their word. The mind is a wonderful tool, the mind is a most unhelpful tool. Think for a moment how you typically start your day. Chances are if you are like 99% of the population within the first hour of being awake you are on your smart phone, computer or tablet. What an age we are living in…so many options for how we will check our email, latest updates on social media and see what is going on in the world. Information is readily at our fingertips nowadays and it seems we are taking in far more than we can process. This is our current reality, and I am not suggesting whether or not we change these ways. I am however suggesting we find some time throughout the week to slow down. The article, The Surprising Weekend Habits Of Highly Effective People offers a gentle reminder of what it means to slow down. May favorite example from the article of slowing down was Warrior’s, “digital detox” and meditation. Our minds need space to process the same way our food must digest. If we were to keep filling our stomachs the way we fill our minds, we would explode! Chinese Medicine believes over thinking and obsessive thought weakens the digestive system. It is important that we find time to unplug, let go, and digest everything we have seen, touched, tasted, thought and experienced so that we may prepare for the real work before us. Where does disease come from, and what can we do about it? – From the perspective of a Chinese Medicine practitioner and Acupuncturist. The above quote comes from a well known Chinese Medicine practitioner. The words that follow are my interpretation of his quote. The first thought that comes to mind in regard to diseases manifesting from the Heart are in relation to the Shen; the emotions, and the Spirit. Disease that begins as a non-physical emotional imbalance tends to transform into the physical. An emotional imbalance left untreated for a long enough duration will begin to cause stagnation in the body, first damaging the superficial aspects, and over time will penetrate deeper into the body leading to more severe damage. I am not sure it is possible to say that all disease does or does not come from the Heart. There are people who follow this trajectory of emotional imbalance and with enough time will develop tumors or cancer that seem to manifest out of thin air. The physical expression that appears seems correlated to the aspects of the mind and body that are not visible to the eye (or CT scan/X-ray) but do co-exist within the physical. The potential for recovery of a person who has been suffering from the Heart for such a long time will have a greater chance of giving up, because they have nothing to hold onto, as they are living with void. Then there are those lying on their death beds whom you would have no idea are suffering, because they are so intact emotionally, and their spirit is at such peace. Only one of these two people can I confidently say became sick from pathology of the Heart. On the surface, this quote represents the idea that any ailment will develop from an emotional imbalance, or hallowed space of a person. I believe the core of this quote is not to say whether or not all disease does or does not manifest of the Heart, but instead to show the underlying importance of a peaceful Heart. One can only suffer if they identify with the suffering. One who cannot see clearly, or is veiled from the light will suffer a great deal in his or her life. One who loves themselves can then learn to love all beings. One who is capable of only love can know the art of living, with or without a disease or diagnosis. In the end, it is the spirit that decides. Once the mind begins to go, the soul leaves the body and there is only one solution left. I can say that with a strong Heart one can overcome anything and be protected. I cannot say all disease comes from the Heart, but perhaps instead that the Heart can cure all disease. My on-going studies as an Acupuncturist/Herbalist in Chinese Medicine remind me on a daily basis that nothing is definitive and there are no absolutes. What does this have to do with cravings? Well, for one, why you or I might crave something will be different. Why he, or she, craves sweet or salty food might be different for each person. Sometimes we crave foods or flavors that our body truly needs, and other times we crave foods that may cause more harm than good. So how do we know if what we are craving is good or bad for us? Walking home after a recent yoga class I had a sudden craving for fast food. I thought, “This is not good for me, so why am I craving it?” Then I had a flashback to 8 years ago when I used to smoke cigarettes; I would walk out from the gym and get one of those pesky cigarette cravings. How is it after we have done good work for our bodies we could crave that which does not strengthen us? While we are doing this good work we are circulating more oxygen and blood and in turn flushing out old cells. When our minds and bodies detoxify our cells begin to break down. The toxic build up from unhealthy food, environmental or daily stress and emotions start to release and our bodies prepare for the process of elimination. This is a very crucial time, a time when we must practice restraint and go above the natural tendency to act on our cravings. As the cells release from where they have been stuck the memory of the cell’s past kicks in and the brain wants to fix ‘the problem’. The only problem is, there is no problem. The brain thinks there is a problem, but the body is merely detoxifying. So rather than send a message for steamed broccoli or cooked carrots the brain tells us to smoke a cigarette or eat fast food because this is what we have done in the past, and perhaps what used to serve us, but no longer does. So what do we do? This is the time to drink water and help your body flush out those pesky toxic cells. Craving a cigarette after the gym is the same as craving fast food after yoga. Mind you, I have not had fast food in years. So why did I have a craving for fast food? Perhaps the cells released during yoga were from a time in my life when I ate fast food, maybe from childhood or college. Perhaps these cells were a time of sadness from my past and have been stuck all this time deep within my muscles and my mind and body relived that moment when I was upset and met my sadness with fast food as a coping strategy. There are so many reasons why. As someone once told me, it is easy to be tortured by the why. In this case, I don’t think the why is necessary. The key to understanding our cravings is to step back and give time and space to ask, if I act on this craving, will I feel fulfilled, loved and healthy? If the answer is no, this is reason to celebrate; your body is letting go of toxic build-up which no longer serves it. Take this time to let your body do its’ work and flush out the old cells. Note: The ideas in this article are the opinions of Jen Marks, L.Ac.. This information is not intended as medical advice. Please consult a Chinese Medicine Practioner or Primary Care Physician before attempting to diagnose and treat your condition. If you would like to discuss cravings, or anything else that came up for you while reading this article, please feel free to e-mail me. If you are interested in receiving Acupuncture or any other modality of Chinese Medicine, please visit my webpage or contact me at JenMarks8@gmail.com . Blessings and Balance to all. A few weeks ago I had a cough that I could not seem to shake. It was very mild and weak, but persistent. I decided to take a trip to my local health food store to see what types of herbs/teas they sell. I came across Astragalus Root/Huang Qi. Huang Qi is an herb frequently used in Chinese Medicine herbal therapy. This herb is most well known as being a Qi tonic to boost the vitality of the Lungs and the Spleen. My knowledge and background as a Chinese Medicine practioner is what guided me to select Huang Qi for the particular type of cough that I had. I knew based on the quality of the cough and my pulses that my cough was due to deficiency. I also selected Pau d’Arco, an herb native to the rainforests of South America. I chose Pau d’Arco due to my previous experiences with the herb for brewing tea. I was aware of its’ uses as an anti-inflammatory and immune system enhancer. According to the American Cancer Society, “Pau d’arco is promoted as a cure for dozens of illnesses and medical conditions, including arthritis, ulcers, diabetes, and cancer.” (http://www.cancer.org/treatment/treatmentsandsideeffects/complementaryandalternativemedicine/herbsvitaminsandminerals/pau-d-arco), Last Revised: 01/16/2013. The final addition to the tea were rose buds/Mei Gua Hua. Rose buds are used to treat in Chinese Medicine, they work to calm and relax the nervous system. They are known in Chinese Medicine to promote the movement of Qi. After paying for the herbs I headed home to prepare my tea. I placed 2 and a half slices of Astragalus Root in a medium sized pot and added about 2 cups of water. I brought the water to a rolling boil and then reduced the flame to a simmer for 30 minutes. Once the 30 minutes passed I discarded the Astragalus from the pot. I then placed 1 and a half teaspoons of Pau D’Arco into a tea strainer with 4 rosebuds and poured the water from the Astragalus Root over-top to brew for about 5-7 minutes. One cup of this tea and my cough was gone. This article’s purpose is to enhance perception about the different ways in which we are able to treat ourselves from a natural source. Taking care of ourselves does not have to compromise our wallets nor must we sacrifice for relief of one symptom only to gain a new problem to treat due to medications that offer more harm than good. If you are interested in learning more about using herbs for treatment call a local acupuncturist/herbalist to make an appointment, find a workshop/class, or speak with an educated sales associate to guide you at your local health food store. Blessings and Balance to all. Note: This information is not intended as medical advice. Please consult a Chinese Medicine Practioner or Primary Care Physician before attempting to diagnose and treat your condition. When we exude love onto others, we create more love for ourselves. When we are able to love ourselves, we are able to exude love onto others. When we love, our mind is clear, our body feels at peace, and our ails and woes seem to disappear. Love is the best remedy for all of our problems. Love is the key to keep our Qi moving freely. I never saw myself as being a writer, or a blogger, or really even understanding the idea. Then I decided to stop thinking of myself in terms of a label, and rather in being more like fluid water moving where I found space to move and receding when it was time, whether by guidance of the moon, or my own intuitive nature. Since releasing myself from this idea of, “I am a _______” I have found more freedom in my life. This is not to say I do not find myself in a sea of labels from time to time, but more that I have taken note, and practice existing as the greater whole rather than existing as a part or thing of the whole; this allows me more space to feel connected. Over the past ‘x’ years, I have found my voice, and learned that it is okay to speak my mind knowing that I am pure, whole, and love. Those who are able to hear my voice will love me unconditionally, as we all should love each other. Love, more than any other source, is a never-ending well reaching beyond the depths of consciousness and understanding of the rational mind. There is always more love to give and to receive. I have been sharing my thoughts and ideas as they come, because it allows others to know me better, it allows me to know myself better and it is a practice of love. I write to love myself, I write to love others, I write so that others will love me and each other. In the name of love, these are my words. We cannot push the door that is not ready to be opened. We can only check back in with the door, and when it is ready to be opened, we can be there to open the door. Push yourself a little today to do something in the name of love. If you don’t feel the love today, that is okay. Keep checking back in with that door, but know, one day that door will open and then you will be ready to walk through upon it’s gracious swinging. It is easy to get caught up in what is around us, our wants, cravings, and distractions. We too easily look around in search of something we can see, taste or hear. Instead of looking out, take a few minutes today and look within. Find a comfortable seat on the floor, or on a chair. Close your eyes and place your hands on your lap, palms face up or face down, whichever feels more comfortable at the moment. Focus your attention on your breath, you can place your hands on your belly to help attune your mind to your breath. With each inhale, feel your belly fill up and push outward. With each exhale feel your belly pull into your spine to release all of the air. Sit for as long as you can, or set a goal for yourself; 3 minutes, 5 minutes, 10 minutes, the important part is not for how long you sit, but that you took a few minutes out of your day to look within. Set yourself up for success, push yourself but not so much that you fall. Be kind to yourself, allow your mind time to expand and to release. Smile. Chinese Medicine correlates Spring with the East, the ZangFu (OrganBowel) pair – Liver/Gallbladder, the color green, wood, wind and birth. Spring is birth, from out of the darkness and cold and into the warmth and light. The flower blooms, the seedling sprouts, and we too begin our new cycle of growth. This can be a difficult time; a time when we feel change is not happening fast enough. In the way the seed buried under the snow thinks it will never sprout and see the days of sunshine again, we too may share similar feelings with our ideas and desires. Spring is the time for new ideas that have been cultivating in the shadow to grow, to move upward and outward and to dance in the days of light. Now is the time to step outside and create. This is not to say the process is easy, it is no easy challenge to move from the still nature of winter into the upward spirals of spring. Take your time, be kind to yourself, but push yourself to move forward. Your work will be rewarded, may the sunshine be your guide. Liver is the yin organ associated with Spring. Liver rules the emotions, ensures the free flow of qi, stores the blood, controls the sinews, and opens to the eyes. – Open all of the windows in your home, burn some sage or a few sticks of incense around your house. Let the stagnant energy be cleansed and carried away. – Spring-cleaning, it is an idea as old as the Earth and as wise as the Sages. This is the time to go through and discard what is no longer necessary. Open the closet doors, the dresser doors, and the cabinet doors. Organize what you have, keep what you need, and donate the rest. Make space for yourself. – Indulge in dark leafy greens. Take a trip to your local health food or grocery store and pick up some chard, kale, collards and if they have it, buy some dandelion (Pu Gong Ying). This bitter green is perfect for spring. Many of you might only know dandelion for being a weed, but like many weeds, this is a great medicinal plant used commonly in Chinese Medicine. You can sauté with butter and garlic, steam, boil, or add the dandelion to a green smoothie to enjoy in your day. Dandelion is bitter, sweet and cold. It enters the Liver and the Stomach. This plant will help to cleanse your Liver so that your Qi may flow better in the Spring. – If you are familiar with types of cleansing or fasting, Spring is a great time to do this. I would only recommend fasting to those who are experienced or are under the direction of someone who can assist in the process. Fasting can be a great way to cleanse the body, but it should be done in a way that fosters healing, and does not further tax the body. – Find a quiet place outside, sit on a patch of grass or a comfortable bench, close your eyes and breath. A 5-minute meditation to ground yourself and connect with Spring. You can also place your hands over the area of Liver and with each breathe, breath light and clarity into the organ and with each exhale, release the stagnation and toxicity. This will make your Liver happy and feel supported. – Come in for an Acupuncture treatment. Together we will get your Qi flowing, and harmonize the meridians of your body so that your connection with Spring will expand with greater ease. No matter how you choose to connect with Spring, remember to smile, embrace the warmth, be thankful for the day and to keep moving forward, your efforts will be rewarded. The transition from Winter into Spring can be a tough time for many of us. For me personally, going too long without a sun-filled, warm breezy day can start to feel like I am fading into the dark wilderness of Winter. For a while it seemed as if Spring was not going to happen down here in Savannah. I was recently up in New York City visiting friends and family, and it most certainly seemed as if Spring was nowhere near the north. Since I have been back in Savannah I can say, Spring has officially sprung; we can raise the blinds, open the windows, step outside and take a deep breath, Spring is here. The weather is warm, the flowers are blooming and the birds are chirping. Sustainability, fresh food, and sharing of abundance. These are three practices we can all strive to add into our lives. Everyday is a chance to learn, grow and appreciate. There are good things happening in Seattle, the first Food Forest, is opening to the public. Plants and Fruits, free for the taking and plucking from the trees. This is a beautiful concept and more so, a reality that has been set into place by Beacon Food Forest. Great job Seattle! I hope to come pick some fruit soon, plant a tree, and see this idea begin to expand into other cities around the world. Starting May 1st, Jen will be practicing at Lowcountry Natural Health Center at 2431-B Habersham Street in Savannah, Ga. She is now booking appointments for May. Please feel free to contact her with any questions or to schedule an appointment. You’re lovely, Jen Marks. Really great, informative, thoughtful and authentic writings.